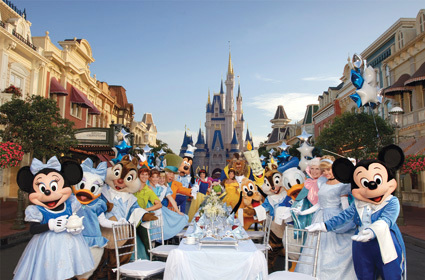 Disney World in Orlando, Florida is inviting you to be their guest during their limited time "All-Inclusive" offer. Package prices are starting at $475 for 5 nights, per person! • Accommodations for 5 nights at a Walt Disney World Resort Hotel. • Disney's Magical Express round trip Airport/Hotel Transportation Service. • Magic Your Way Base Ticket (one Theme Park per day). Choose from over 100 select restaurants. • Planet Hollywood $10 Gift Certificate. • 2-for-1 Wet'n Wild Water Park Admission. Kids FREE Theme Park Admission PLUS Save Up to 30% on your On-Site Hotel! Stay 4 nights or longer at one of the Loews hotels at Universal Orlando and your Kids (ages 3-9) get FREE theme park admission, PLUS you can save up to 30% on hotel room rates! Enjoy Orlando's most exciting thrills and entertainment PLUS hotel accommodations, all for one great price. Book by July 1st to take advantage of this incredible deal! Accommodations at one of the three on-site hotels: Loews Royal Pacific Resort, Hard Rock Hotel or Loews Portofino Bay Hotel - the longer you stay the more you save! Get one FREE Kids2-Park Unlimited Admission Ticket (ages 3-9) with each paid Adult 2-Park Unlimited Admission Ticket valid for Universal Studios AND Universal's Islands of Adventure theme parks (maximum of 2 FREE Kids Admission tickets per room). FREE Universal Express ride accessˆ to SKIP THE REGULAR LINES all day at both Universal Orlando® theme parks. Plus, Kids Eat FREE at the on-site hotels for Lunch & Dinner: Now - June 10th & August 17th - September 30, 2009, with each paid adult entree!